The national economy and well-being depend on reliable and resilient infrastructure systems, such as clean water, electricity, transportation, communication, and emergency care. Infrastructure systems must withstand disruptions to continue delivery of essential goods and services. After a disruptive extreme event, such as an earthquake or severe storm, the socio-economic recovery of the affected region depends on the recovery of its infrastructure systems. Lifelines, such as power and water distribution systems, transportation networks, communication systems, and critical buildings have a primary role in disaster response, management, and long-term recovery. The failure to rapidly restore the services required for personal, social, and commercial activities leads to continued socio-economic losses and progressive depopulation. This collaborative project brings together scholars in Civil Engineering, Systems Engineering, Computer Science, Economics, Urban Planning, and Policy Making. Its purpose is to establish and demonstrate a comprehensive framework that combines models of individual infrastructure systems with models of their interdependencies for the assessment of interdependent infrastructure system resilience for extreme events under uncertainty. The "PRAISys" platform (Probabilistic Resilience Assessment of Interdependent Systems) will emphasize a probabilistic approach that permeates all aspects of the models, including the interdependencies. Some types of uncertainties that were not considered before (e.g., the possibility of using contingency plans that provide services without functioning infrastructure) will be classified; while mathematical and computational tools will be devised to capture their characteristics. PRAISys will enable better management and design of next generation infrastructure, more resilient to extreme events and to component failures under normal conditions. This will reduce the likelihood of extreme events becoming catastrophic in terms of casualties and injuries, long-lasting socio-economic losses, and environmental impact. The results of the research will be disseminated to the public in various forms: through series of seminars for professionals and administrators; by participating in Lehigh University's STAR academy program for disadvantaged middle and high school students; through scientific publications and presentation; and by curriculum development. 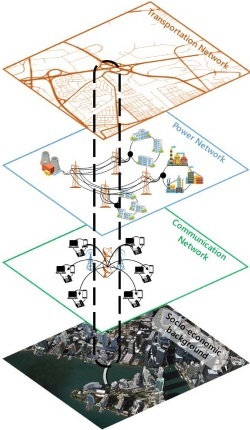 The development, calibration, and validation of PRAISys will enable research on stochastic interdependencies among infrastructure systems in the wake of an extreme event. This requires advancements in several disciplines. For instance, a new hybrid reliability model, which combines graph theory for network analysis and classic system reliability to model the probabilistic dependencies among infrastructures will be studied. The new concept of "uncertain dependencies," which are rigorously modeled and include "contingency plans" will be introduced. Advancements in stochastic network optimization will be sought, to predict the optimal strategies and to inform the disaster management. Social network data will be used as an additional source of information on the recovery of a region, in real time, mining public posts. A comprehensive decision framework will combine the results of the simulation platform with expert opinions and surveys to identify the importance of various aspects of recovery. Finally, new techniques for the collection of large sets of data from utility companies, local government and other authorities will be studied. The infrastructure systems become increasingly interconnected and interdepedent. The interdependencies reflect as the relationships between components, networks, and/or systems. Infrastructure systems are inherently dependent and interdependent in different ways, so that a small failure in one infrastructure system may propagate to the other infrastructure systems and lead to catastrophic damages in a large geographic region. The ability to withstand and recover of one infrastructure system greatly depends on the other infrastructure systems and their interactions. The PRAISys project studys design and performance of these interdependent systems to enable them to perform, despite disruptions and failures from extreme events, in order to better understand interdependencies and their impacts and further improve the effectiveness and efficiency. Resilience reflects uncertainties, meaning that there are a lot of unknown combination of conditions in reality. There are a large amount of uncertainties in the resilience analysis. The uncertainties may lie in event model (probability of occurrence, location, and intensity), material properties of component, functionality and damage model of the infrastructure system, recovery activities, human behaviors and decisions, etc. Resilience research should address the uncertain issues to accurately capture the ability of the transportation infrastructure to withstand the disturbances and recover afterwards. Analytical quantifications of resilience originate from the resilience triangle. There is a significant decrease of functionality due to the occurrence of extreme event at time instant t0, followed by a gradual recovery of functionality Q(t) until the system is fully functional at time instant tr. The resilience triangle shown in the figure consists of three edges: one edge showing the decrease of functionality at t0, the second edge showing the recovery time (tr-t0), and the third edge showing recovery speed. Resilience index R(t) is defined as the product of the intergal of functionality over restoration time divided by investigated time horizon. Critical infrastructure systems consist of components and subcomponents at different levels. The resilience analysis of critical infrastructure systems should be determined from component-level up to system-level. The resilience of transportation network can be enhanced through pre-event retrofit and post-event restoration. Retrofit processes during regular maintenances and the restoration of damaged structures after an extreme event should be carefully optimized to maximize resilience and functionality of the transportation network within limited budget and resources. The following table shows components in three infrastructure systems at different levels.